Click on above picture for a larger version. Armand Giglio warms up the Dagrada in the Monza pits. Baghetti's Dagrada won at Monza in 1960; Giglio departs in celebration. The Dagrada engine. Note the intake setup and split exhausts. While Baghetti cut his teeth on Alfas and Abarths in local events, Dagrada was dreaming of a special car to compete in the new Formula Junior. Chassis design, pre-Chapman, was simple, primitive, and not always effective--a tubular frame with Fiat 1100 front suspension and whatever live axle fit at the rear. Dagrada, always an engine man, would do it his way. 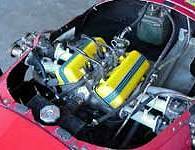 While virtually every other Italian Formula Junior constructor chose the Fiat unit, Dagrada took a good look at the 1098cc Lancia Appia engine. Featuring a sturdy 10-degree V-4 cylinder cast-iron block, the Appia was the right displacement, readily available and relatively light. However, it suffered with an intricate aluminum head that stymied any attempt to make it a breather. Dagrada's modifications to the Lancia head were diabolic. He virtually re-designed the head, creating new intake and exhaust ports. The Appia suddenly became a fire-breathing cross flow head. Hanging a Weber 38 DCO from each side of the block, he then tuned the exhausts for maximum effect, capable of eardrum-busting decibels, unevenly pulsating from two megaphone exhaust pipes (although some used a combined system). This recipe just about doubled the horsepower from 48 bhp to somewhere around 100 bhp. Dagrada then graced this with an aluminum body reminiscent of the 250F Maserati. So was the Dagrada, which, like so many others, was made obsolete by the British rear-engine revolution. One of the Dagradas, chassis number 9, was imported by Marty Biener in Great Neck Long Island. The new owner drove it in a few races, and parked it, eventually selling it in 1980 to Armand Giglio, an American Lancia enthusiast. In 1988, Giglio persuaded the retired Baghetti to drive the car at the Pittsburgh Vintage races. Despite a misfire, Baghetti finished in front of the rest of the front-engined Juniors. 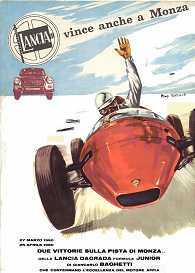 "It's an old car," said Baghetti, "but I was very happy to race it again." Recently, James Steerman purchased the car from Giglio. He'd like to find out anything he can about other Dagradas. James's email address is aureliaspider@yahoo.com. Two video's are available. Click on the pictures.